Jeremy Swayman of the University of Maine, pictured in Orono during the 2017-2018 season, has been named to the Hockey East All-Rookie Team. 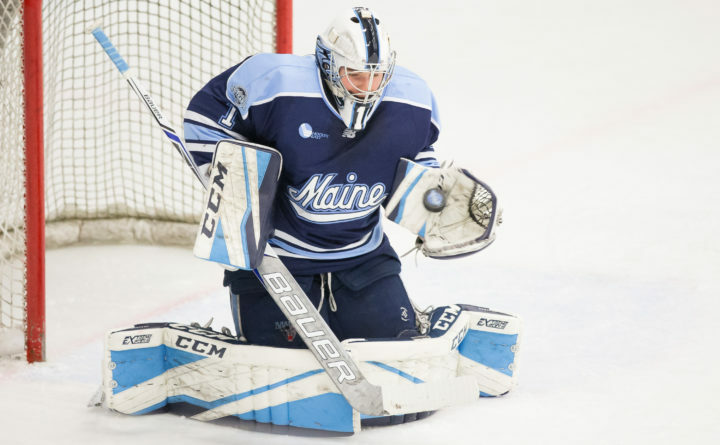 Goalie Jeremy Swayman, who backstopped the University of Maine men’s hockey team to an 18-win season — the most wins since 2011-2012 — was chosen to the Hockey East All-Rookie team and was an All-Hockey East honorable mention. Sophomore center and co-captain Chase Pearson also was an honorable mention. The all-league teams and all-rookie team were selected by the coaches, who were not allowed to vote for their own players. The 6-foot-3, 200-pound Swayman, a native of Anchorage, Alaska, compiled a 15-12-3 record, a 2.72 goals-against average and a .921 save percentage. His save percentage ranked 14th in Division I and fourth among freshman goaltenders. In Hockey East play, Swayman was 9-9-3 (2.72 GAA, .920 save percentage). Swayman, one of three goalies on the United States team at the World Junior Championships, held opponents to two goals or less in 15 of his 30 starts. He made at least 30 saves in a game 16 times and had 10 games with at least 35 stops, including a career-high 50 saves in a 7-4 win at Quinnipiac on Dec. 8. “Obviously, he had a heck of a year for us,” said UMaine head coach Red Gendron. “He deserved the accolades he received, that’s for sure. “He played very well. He shouldered most of the load, particularly in the second half,” said Gendron. Swayman is joined on the all-rookie team by Northeastern goalie Cayden Primeau, Massachusetts defensemen Cale Makar and Mario Ferraro, and forwards Shane Bowers and Brady Tkachuk of Boston University and Logan Hutsko of Boston College. Pearson was UMaine’s second-leading scorer with seven goals and 20 assists. He tied for seventh in the league in assists. Pearson, a 6-2, 205-pound native of Alpharetta, Georgia, registered four goals and 15 assists in 23 Hockey East games. He won 54.9 percent of his faceoffs and his 486 faceoff wins (486-399) led the league. He also blocked 24 shots. The Hockey East first team is composed of Primeau, defensemen Jacob Bryson (Providence) and Jeremy Davies (NU), and forwards Adam Gaudette and Dylan Sikura of Northeastern and Erik Foley of Providence. The second team includes goalie Hayden Hawkey (Providence), defensemen Dante Fabbro (BU) and Casey Fitzgerald (BC) and forwards Bobo Carpenter (BU), Maxim Letunov (Connecticut) and Nolan Stevens (NU). The third-teamers were goalie Joseph Woll (BC), defensemen Michael Kim (BC) and Makar, and forwards Brett Seney (Merrimack), Brian Pinho (Providence) and Jordan Greenway (BU).